Minions are yellow henchmen who have existed since the beginning of time, evolving from yellow single-celled organisms into beings who have only one purpose: to serve history's most ambitious villains. After their ineptitude destroys all their masters, including a T. Rex, Genghis Khan, and Dracula, they decide to isolate themselves from the world and start a new life in Antarctica. Sometime in the 1960s, the lack of a master drives them into depression, so Kevin, Stuart, and Bob set out to find a new one. They arrive at a villain convention, where they compete for the right to be henchmen for Scarlet Overkill, a stylish and ambitious villain determined to dominate the world and become the first female super-villain. Download The Minions in Digital HD from the iTunes store. The Minions images are © Universal Pictures. All Rights Reserved. Let's face it one of the best parts of the Despicable Me movies are those cute, little, yellow guys that speak a made up language. The minions are funny, goofy and adorable and now they have their own movie. Minions hit theaters July 10th for 90 minutes of utter cuteness. Throughout the centuries the minions have only looked for a master to serve. They are happiest when evil villains are bossing them around but, after a series of unfortunate mishaps, they find themselves with no one to follow. Alone in a frozen cave they are wasting away and their very existence is threatened. When Kevin, along with Bob and Stuart, set out to find a new leader, they find themselves in Orlando at the super secret Villain Con convention where they vie for the chance to be Scarlett Overkill's newest henchmen. At her request, they steal the Queen of England's Crown and accidentally double cross Scarlett, enraging her and causing her to want to seek revenge on them. Starring Sandra Bullock (The Blind Side) as Scarlett Overkill, Minions has a star studded cast including Geoffrey Rush (Pirates of the Caribbean), Allison Janney (Spy), Jon Hamm (Mad Men) and Michael Keaton (Toy Story 3). Bullock portrays Scarlett with just the right balance of the sweet "girl next door" persona we know and love mixed with the evil and diabolical villain she showed signs of in The Proposal. Hamm does a great job playing Scarlett's equally as evil nerdy husband and Keaton and Janney have terrific smaller roles as bank robbing parents who give Kevin, Bob and Stuart a ride to Villain Con. While the little yellow creatures are adorable and there are some really funny and cute moments in the film, I was a little disappointed. The plot was lacking and served mainly as a backdrop for the minions' antics. 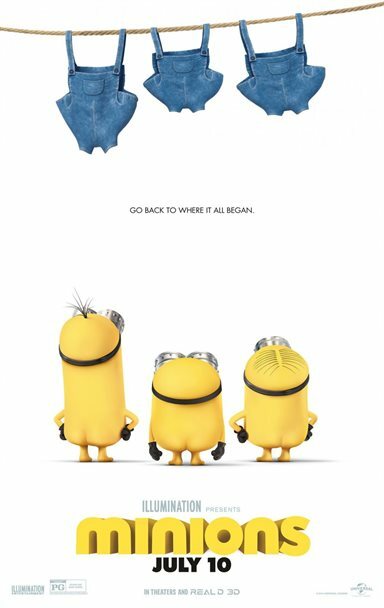 I – and I'm sure I'm not the only one – was very excited when it was announced the minions would be getting their own movie but this just didn't live up to my expectations. The 3D effects are excellent and truly worth the extra money for admissions. The colors are vivid and bright, especially when popping off the screen, which helps to enhance the audience's viewing pleasure. However, the standouts in the movie are really minion Bob and the soundtrack. Set in the 1960's music is filled with classic rock songs including the Beatles and the Monkees. One can't help but sing in dance in their seats throughout the film. Bob also has some of the cutest moment sin the movie bringing many of the laughs. Saw this last night with some neighbors and it was good!